Wednesday March 4, 6:30 p.m. – 8:30 p.m. Enter by side door: Punch in the new winter code (contact us for code). When the green light glows, pull open the door. $5.00 voluntary contribution to Burlington City Arts for their education programs. Jennifer Alderman explained the Guild’s book project for a collaborative flag book to be displayed at the Echo Lake Aquarium & Science Center next summer during the 400th Anniversary of the naming of Lake Champlain by Samuel de Champlain, a year-long celebration that begins next summer on the theme of Vermont: The Lake, The Land and The People. The artwork can be a painting, drawing, collage (keep the layers thin). Use 5” x 5” of any stiff paper, such as cardstock or watercolor paper. The paper’s grain should run from the top of the artwork to the bottom to match the grain of the accordion fold (vertical). 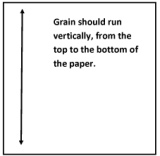 To determine the grain, lay the paper down on the table. Curl one edge (as though you were going to fold it) and compare the ease of curling it to the next, perpendicular edge which you curl. The grain runs matches the direction that curls easiest. Note: If your artwork grain does not match the grain of the accordion it will be glued to, the tension is likely to cause warping or torquing. Sign your name on the back of the artwork along the left side (the right side will be glued to the accordion fold). Bring or send the artwork to a Book Arts Guild meeting, April 1st at the latest. *** Note: It would be great if we could deliver them to the March meeting, offering confirmation that there will be enough to assure the project’s success. When people arrived, the tables were already laden with ribbons, doilies & lots of glitzy, creative materials to help us create unique cards. We learned a paper weaving technique that challenged our minds and hands but led to delightful results. People freely shared materials and ideas as well as boisterous conversation. Pictures from the February meeting can be viewed on the B.A.G. blog. Thanks Megan and Jean for a fun evening! Tejpa is a women’s papermaking cooperative comprised of five artisans from Tontolo, Honduras. Living in their small village secluded in the mountains they work together to produce handmade sheets of specialty paper from plants and flowers in their area. You can enjoy their beautiful paper in a variety of ways. It is sold in 9”x12” sheets for $2 each or 10 for $15. They also create various products including: small boxes (round and heart-shaped), ranging from $4 to $6; picture frames for $8; stationary items and cards, ranging from $2 to $6; and blank books and journals, $8 to $15. If you are interested in learning more about the Tejpa Co-op, their products or this project please click here. I will also be attending the next Book Arts Guild meeting in March, where I will bring as much product as I have available. I am also available to meet one-on-one if you would like to see the Tejpa products. I am always open and eager to any suggestions or insights regarding paper, handicrafts, small business, community development, sustainability and more. Please don’t hesitate to get in touch! *** Are you participating in Open Studio Weekend? Please respond with information so it can be posted in the “MailB.A.G.”! Hello! I’m writing to introduce myself and inquire about bookbinding in Vermont. My name is Elizabeth and I’m currently working/residing in Newburgh, NY but will be relocating to Colchester, VT this spring. I am a bookbinder recently trained at the North Bennet Street School. It was recommended to me by Susan Bonthron (BAG member) that I contact you to inquire about potential work opportunities in the field as well as finding a studio where I might have access to bindery equipment. *** There have been so many new members as well as changes in contact information that listings will occur in an upcoming e-mail of the updated contact list. Also, Lorraine Reynolds piece was in a show I juried at Lafayette College and it looks great!!! Great work Lorraine and thank you so much for submitting. It’s a delightful piece. *** The Book As Art: Artists’ Books From The National Museum of Women in the Arts: February 14 – May 31, 2009 at the McMullen Museum of Art, Boston College, Chestnut Hill, MA. The Guild’s “Dazzle & Pizzaz” committee decided that it will not organize a fieldtrip since several other special events are in the works. Instead, members should arrange carpools on their own. Using our chatroom would be a good way to do this: http://groups.yahoo.com/group/BookArtsGuildVT. Time: 10:30 a.m. – 4:30 p.m.
She will also be doing a free demo on Friday April 17 from 2:30 p.m. – 4:30 p.m. on making Altoid tin box shrines at the same location. *** The Garage Annex School, Inc. in Easthampton, Massachusetts has their 2009 workshop schedule available on their website: www.garageannexschool.com. In addition to the schedule of workshops, we are now offering a six-week, full-time leather bookbinding class, the Summer Institute, June 22 – July 31, 2009. The course includes cover design techniques such as leather onlay and dyeing, gold tooling, and stamping. Students will produce full leather bindings as well as a series of models at various stages of completion. This course is a great opportunity to learn and practice leather binding with Daniel Kelm. Instruction will take place Monday – Friday but you will also have access to the studio evenings and weekends so that you may practice to your heart’s content. *** Haystack Mountain School of Crafts has their 2009 workshop schedule on its website: www.haystack-mtn.org. from → B.A.G. Meetings, MailB.A.G.